Note: As you can guess from the cover, this is essentially a combined biography of the nine actors (at the time) who had officially played the Doctor on-screen: the seven classic series Doctors, plus Paul McGann & Peter Cushing. 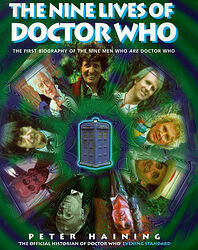 For a more recent book using the same basic idea, see The Doctors: Who's Who. First shown on 23 November 1963, Doctor Who has become a huge international success with a cult following that swells with each new generation of Time Travellers. 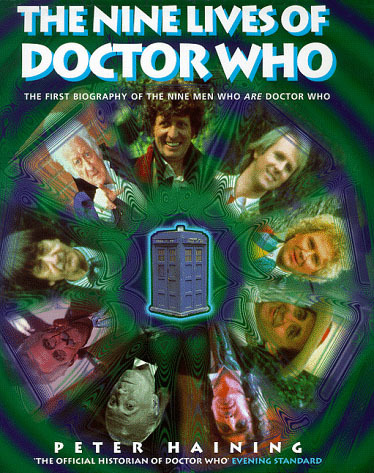 This is the first biography of the nine men who have taken on the role of the legendary Time Lord on television and in films. Peter Haining has met and talked to all the actors and is in a unique position to write their stories — what it was like to play the Doctor as well as details of their lives and careers before and after their adventures in the TARDIS. As each Doctor talks about his own experience, we see how their individual characters influenced the role. From William Hartnell's irascible eccentric to Tom Baker's cult figure and Paul McGann's Doctor for the millennium, they all have amusing behind-the-scenes stories to tell and revealing observations to make, all of which enable us to build a picture of how the programme developed into the longest-running science-fiction series ever on television. In The Nine Lives of Doctor Who we meet the men who have been responsible for the Time Lord's enduring popularity. It is a book for long-time fans as well as more recent devotees wanting to embark on their own journey through time. The book also contains a unique Preservation Archive, listing every Doctor Who story and its availability on video, in books and even amateur footage or telesnaps.